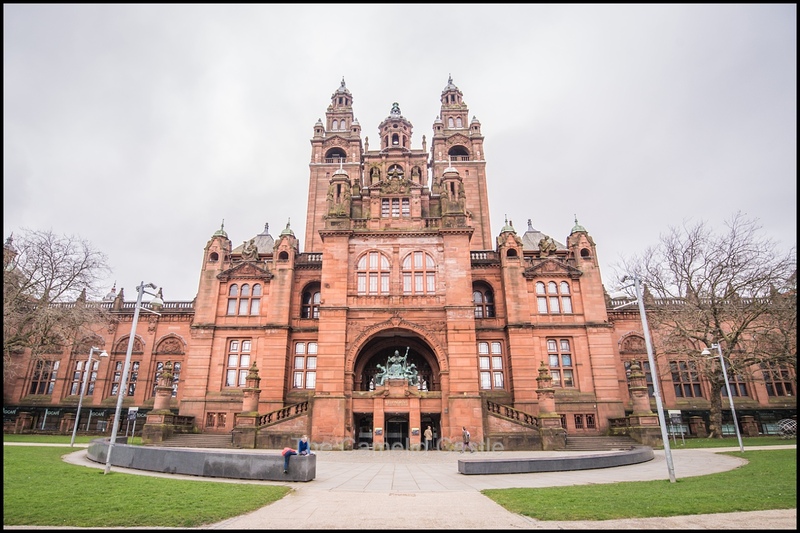 The next 2 days of our week in Glasgow, while Anto worked, were filled with visits to the Kelvingrove museum and park, and the pretty awesome Riverside Transport Museum which the kids loved (especially visiting the tall ship). We shopped and wandered the city and Thursday night headed North to Stirling for a pub dinner and rides on a friends horse, Laddie. 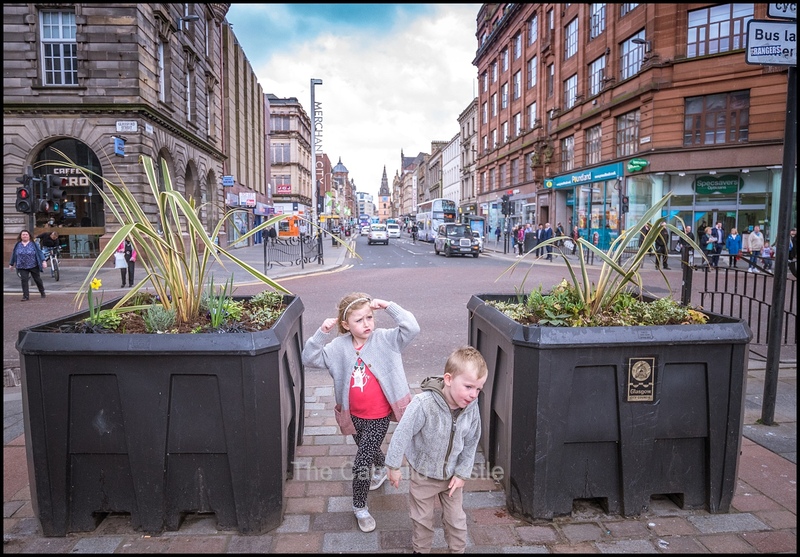 We were finding the free museums and parks in Glasgow were keeping us easily amused and the kids were beyond excited about meeting up with another kid and getting to ride her horse! The kids were awake nice and early by 6.30am to ensure we had time for scrambled eggs before Anto headed to work for the day. Apparently our week of taking it easy didn’t include sleeping in! I decided that after they had a play in the apartment post-breakfast that we should go for a walk further afield and visit a museum. They were happy to play all day and there were a few protests from the children but it’s a long day inside and the weather was still surprisingly good so I convinced them they might enjoy the museum and adjacent park. We head out at about 9.30am for our days adventure. It was 12 degrees and grey but not raining or too windy, so fairly ideal Spring weather in Scotland! 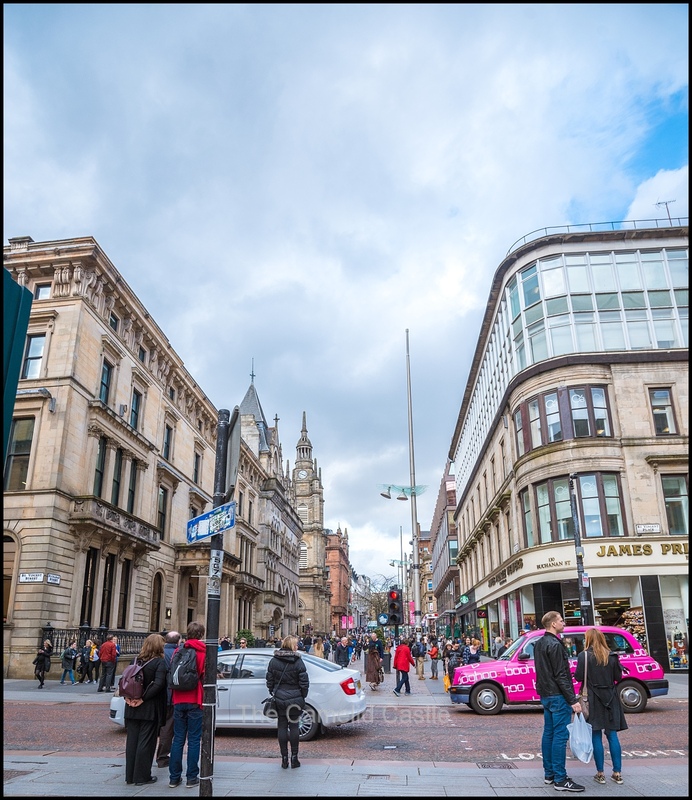 It was only a couple of miles walk to Kelvingrove museum and pretty much in a straight line down Vincent Street from George square. Glasgow is not a flat city so we had a few hills to negotiate but they caused less problems than the thousands of road crossings which made the walk take around 45 minutes as we needed to wait for lights to change as the roads are quite busy. On the upside it was hard to get lost! Pretty soon we spied the museum, which is a rather impressive building and surrounded by lovely green park area. The kids were keen to explore more along the river and in the park but we decided we should head inside and have a look at the museum first. 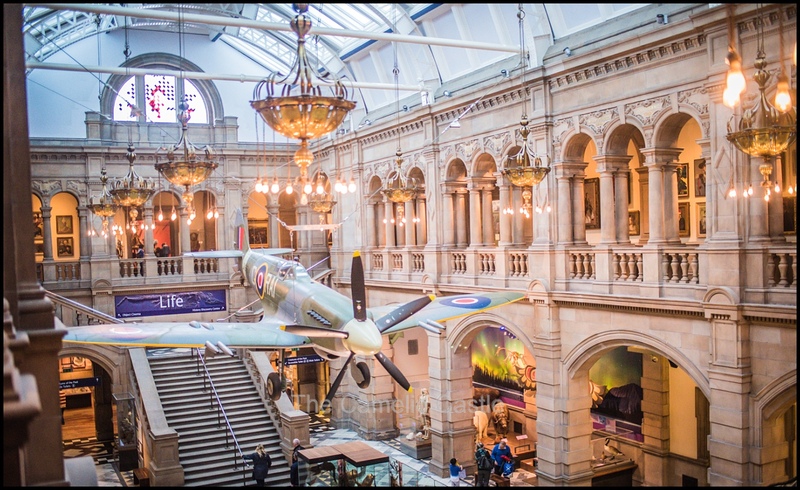 Like most Scottish museums, the Kelvingrove Art Gallery and museum is free. 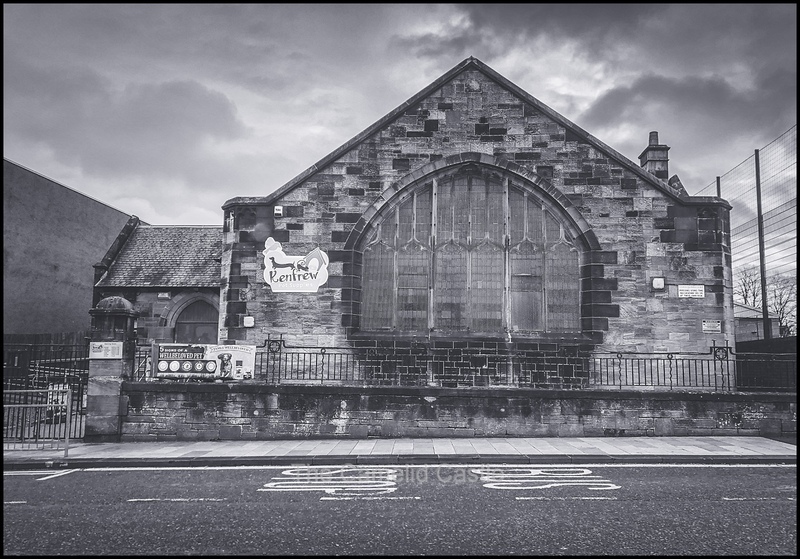 The museum originally opened in 1901 and the building but was extensively refurbished in 2006. The museum has 22 galleries with some permanent and some temporary exhibits including animals, ancient Egypt and several art exhibits. We found there wasn’t really any link between most of the exhibits but there were plenty of things to look at. As we came to discover during our time in Scotland, museums seem fond of large taxidermied animals, of which Kelvingrove had plenty! 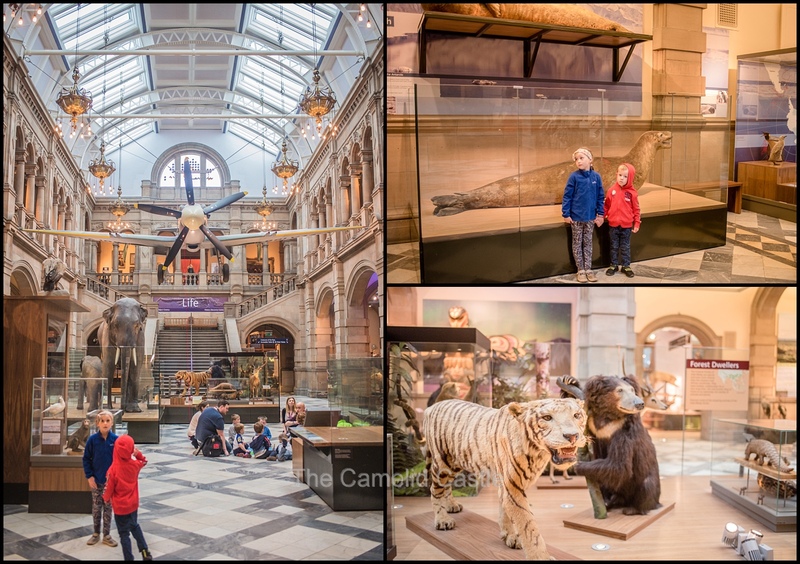 Soren also enjoyed the plane hanging from the ceiling in the main gallery and both kids enjoyed the Ancient Egypt exhibit and exhibits on Scottish flora and fauna and the history of changes to the Scottish environment. They weren’t all that keen on the art and sculpture areas although the suits of armour and model planets were a hit. We ended up spending about 1.5 hours wandering the different galleries they were interested in, and admiring the pretty building. It was now just before 12 so we decided to go to the museum restaurant for lunch, which had a good variety and was well priced (everything in Glasgow seems cheap compared to Iceland). Soren had the kids ‘treasure bag’ with a half tuna sandwich, apple, yoghurt and juice. Astrid had the soup of the day – parsnip, carrot and rosemary and a bread roll and the worlds biggest babycino. The soup was really good and I stole some but also enjoyed my veggie curry! Full of lunch we left the museum and headed across the road to Kelvingrove park. 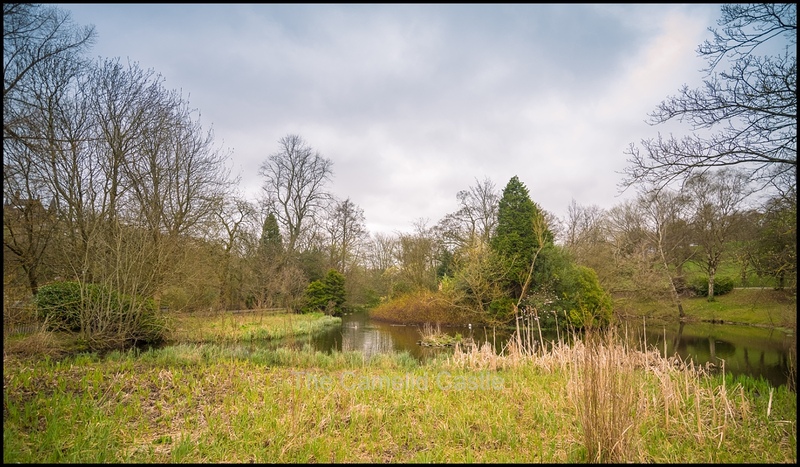 The park is 34 hectares in size and contains the museum and art gallery as well as a skate park, croquet green, several ponds and play areas. The kids were immediately over to the play equipment and they would have spent all day there. Once I extracted them from the play area we had a quick look at duck pond and statues and wander through park, although they declined my offer to walk up the hill to look at the expensive and pretty looking houses and instead wanted to head back to the apartment for some play time. Aside from our detour through Kelvingrove park, we went back to the apartment the same way, which was mostly office buildings and plenty of cafes (several of which would have been nice to stop in if we hadn’t already eaten). 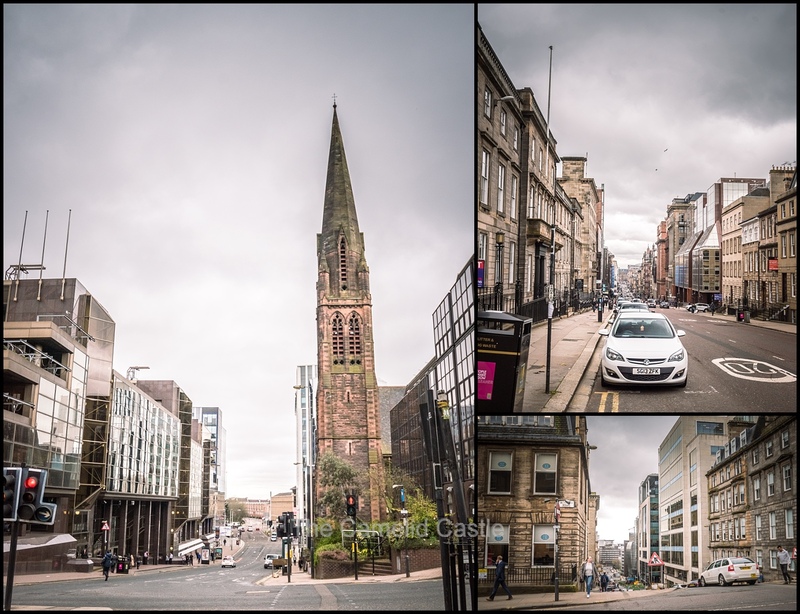 There were plenty of interesting buildings to look at and despite people constantly telling us how ugly Glasgow is, there were plenty of nice areas to be walked through. We made it back to the apartment around 2.30pm and the kids happily spent the afternoon in the apartment aside from an excursion out to the nearby Aldi for dinner supplies. Anto was again up early again for another day of work. The kids and I had a slightly more interesting day planned. After breakfast we had decided to investigate the Scottish train system to visit the Riverside Transport Museum. We could walk from the city, but the return walk was fairly long with 2 kids and involved a lot of main roads so we thought we’d see if I could manage to not get them lost on the train! We walked over to nearby Queen street station and I eventually managed to figure out how to buy the right tickets and where the correct platform – which turned out to be in an entirely different building. We caught the train 2 stops down to Partick station, and then only had a 10 minute walk to the museum. Which was preferable to the hour-long walk in each direction. The museum is easy to spot from a distance, in a quite distinctive building on the edge of the river……. 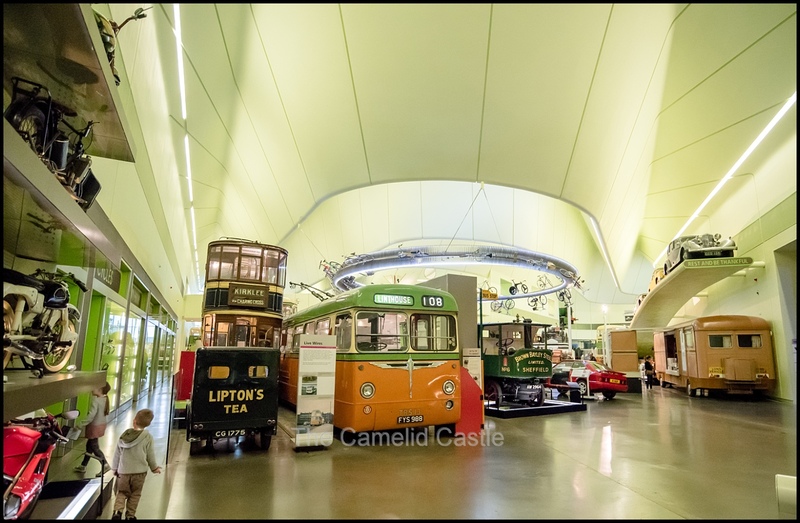 Glasgow has plenty of museums and galleries, and to be honest despite the good reviews I wasn’t exceptionally keen on the concept of the transport museum, but thought the kids would enjoy it. It turns out it was amazing and I actually quite enjoyed myself! Again it was free entry, but I would happily have paid as the exhibits were wonderful. 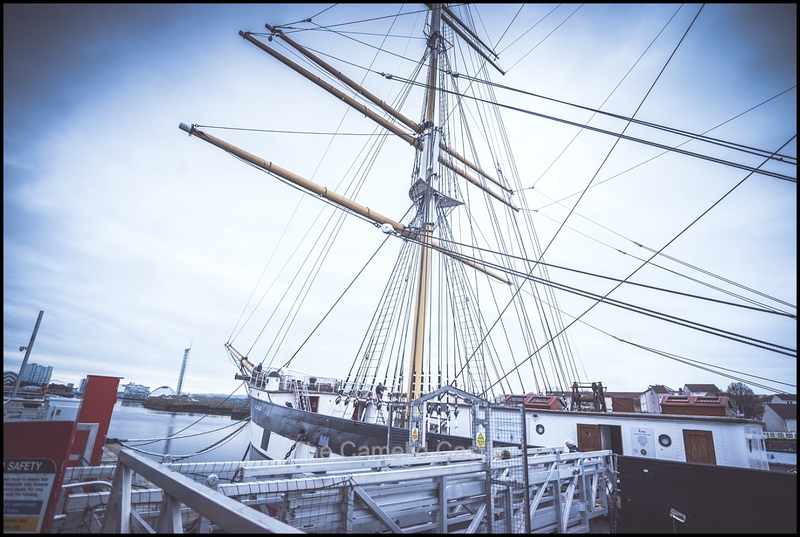 The museum is located at Pointhouse Quay in the Glasgow Harbour regeneration district of Glasgow. 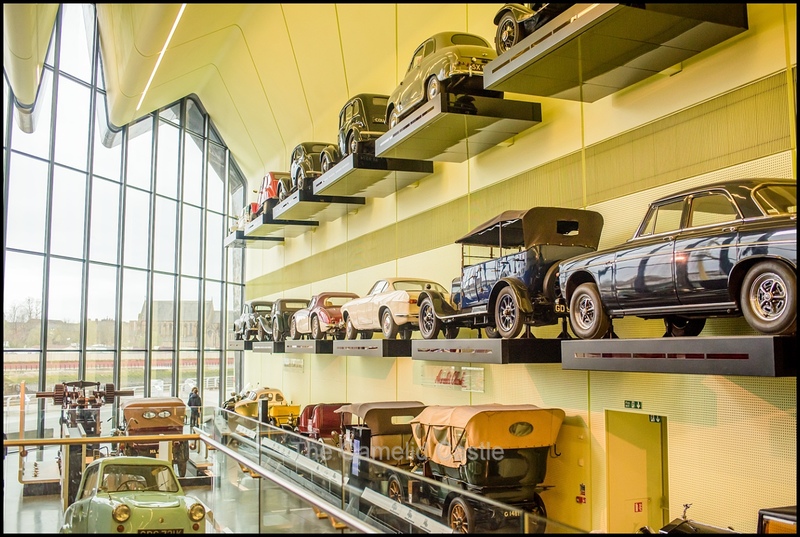 The building opened in June 2011 and in 2013, the museum was announced as the Winner of the 2013 European Museum of the Year Award, and we could see why. 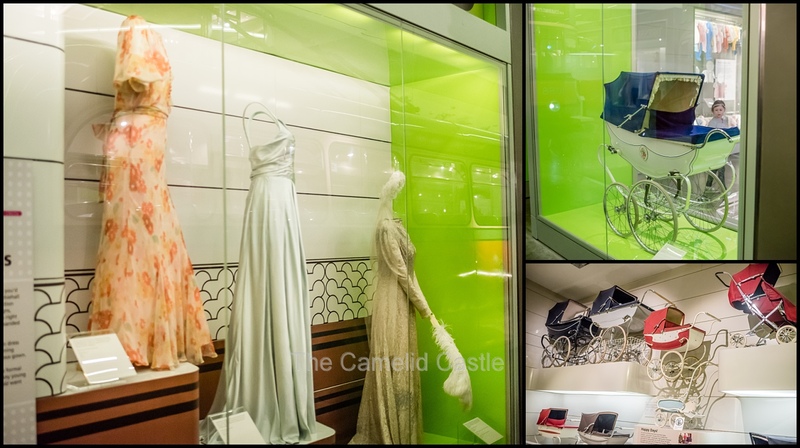 With over 3,000 objects on display there’s everything from skateboards to locomotives, paintings to prams and cars to a Stormtrooper. The museum was entirely hands-on and the kids could climb into and onto many of the exhibits and there were no shortage of interactive touch screens and moving displays. We started out with the trams and trolley cars you could climb into. 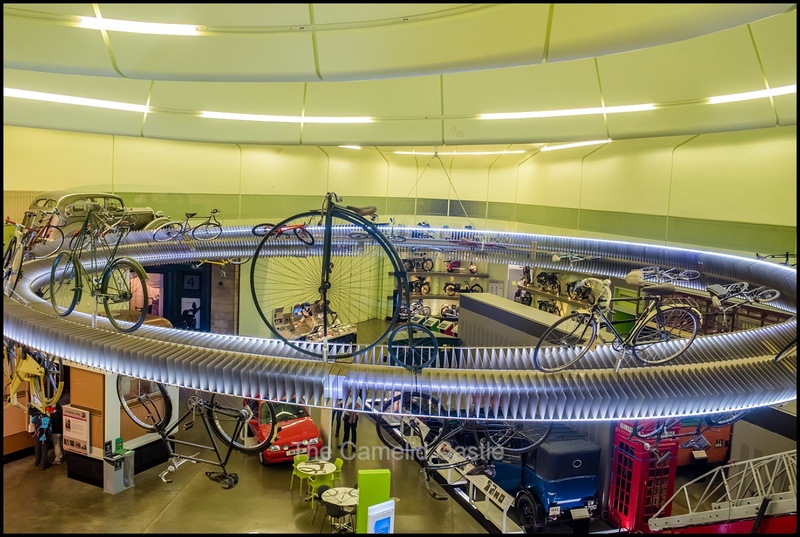 The exhibits were focused on the history of transport in Scotland and in particular Glasgow but the kids loved it! There were also plenty of examples of clothing that was worn at the time and the kids loved looking at the old-fashioned prams and baby clothes. The kids enjoyed the fire and rescue displays, anything fire engine related is right up Soren’s alley! There were also old ambulances and police cars from various decades. The museum is spread over a couple of levels and we did several laps to visit and climb on many of the exhibits. The wall of cars and wall of bikes were quite impressive. There was also a huge display of moving model boats that kept us entertained for quite some time. We spent over 2 hours walking around the different exhibits but could have easily spent longer. There were several school groups visiting who were dominating a few of the interactive displays and games but we had plenty of other things to look at so it wasn’t too much of a problem. After a couple of hours we went outside to visit the tall ship which is also part of the museum. The views from the upper level of the museum aren’t too bad! 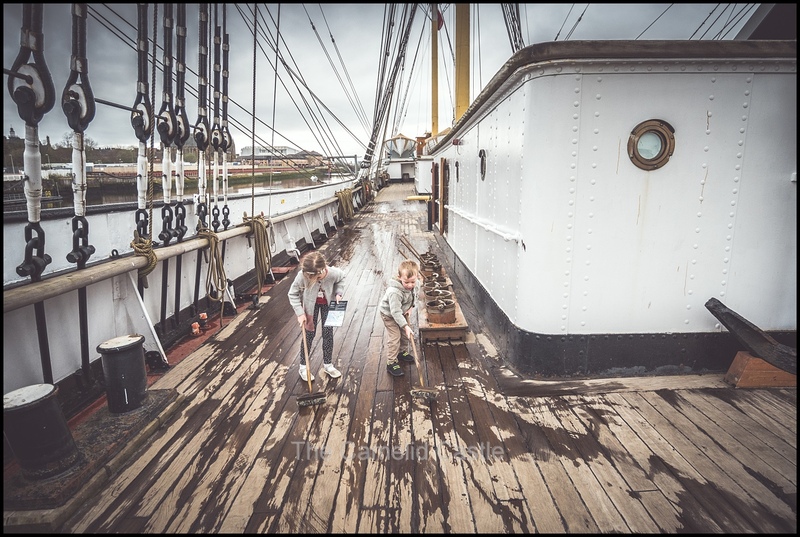 The tall ship was a huge hit with the kids. You can visit the upper decks and the 3 lower decks. Inside there are play areas and a cafe. There are some interactive displays scattered throughout the ship so we had a wander around and the kids scrubbed the decks and learnt about life on a tall ship before we decided to have some morning tea in the ship cafe. After leaving the ship it was back into the museum for another wander, and to have a go on a couple more exhibits before I had to drag them away. We ended up spending over 3 hours there, and could have stayed longer. It was definitely worth the visit! We walked back to train and despite it being delayed managed to get back to apartment in around 20 minutes now we knew what we were doing! We had a late lunch in the apartment and kids had a play for a bit then we went for a wander through the Glasgow streets in the shopping area and picked up a few souvenirs including Soren’s first kilt. Anto came and picked us up around 5.20pm for the drive up to Stirling for dinner with his work friend Jamie and his family. The traffic was horrendous from his office so it took him a long time to reach us from his office and then traffic out of the city was again slow. 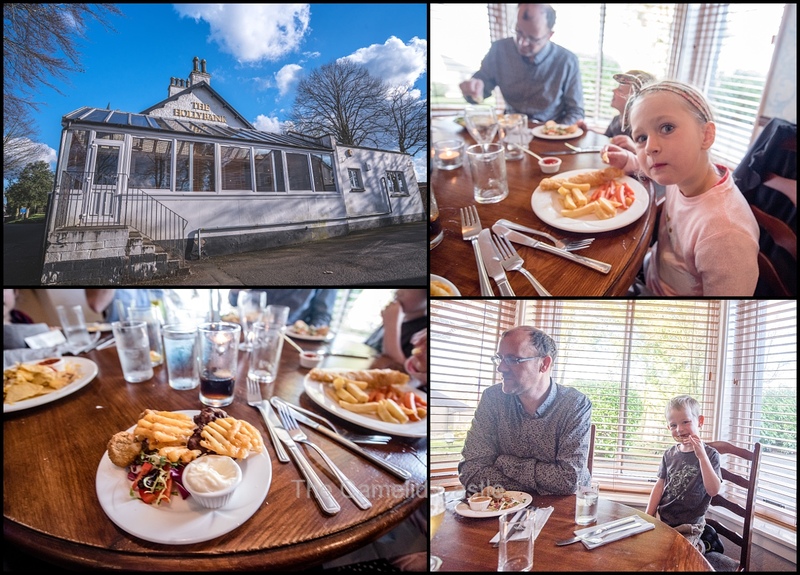 Once we got on the motorway it was better heading North but we still managed to be half an hour late for our 5.30 dinner. We did eventually make it to the Hollyoak Inn and the kids were happy to have Brianna to chat to, it had been a few weeks since they had kids to hang out with! For dinner Astrid had fish and chips, Soren breaded camembert, I had nachos and Hollyoak special of breaded mushrooms, pakoras and potatoes and Anto Haggis balls and fish and chips. In Scotland pretty much everything seems to be fried and/or covered in batter or breadcrumbs! Despite a bit of shyness at the start, by the end of dinner kids were happy to chat. All were keen on dessert but dinner had taken awhile (not helped by us being so late) so we decided had to make the drive out to visit the horses before we ran out of light. 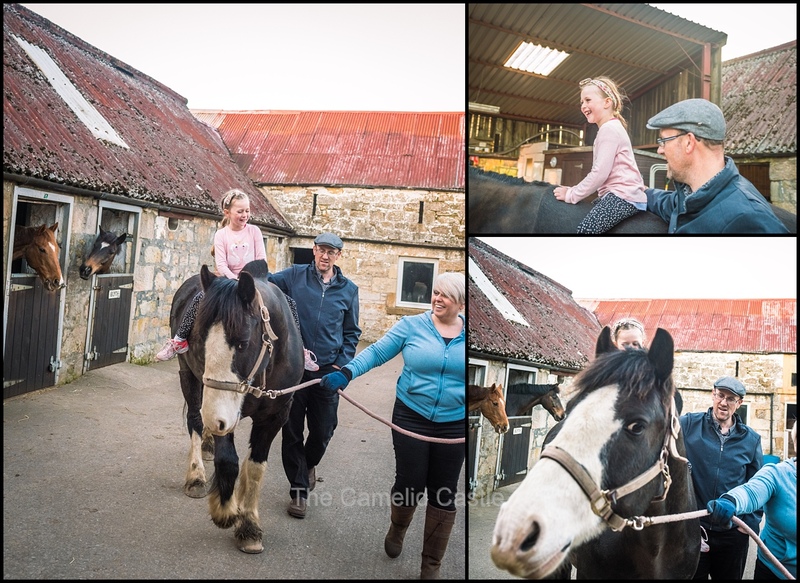 From dinner it was only a short drive to farm where Laddie the horse is located. We were all excited to actually see some of the countryside having been in the city area all week. Once at the farm all the horses came out to say hello, keen for some evening mid-week visitors and attention! We started out with some pats of Laddie and Wex. Wex was getting a little bit excited at visitors and was banging around his stable looking for sweeties. 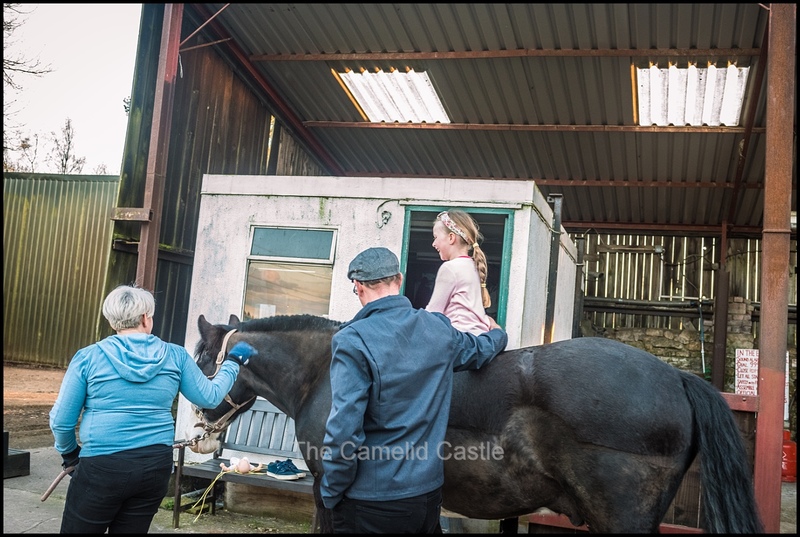 The kids were keen to give all the horses pats and attention……. They helped Ceri and Jamie give Laddie lots of pats and a brush. 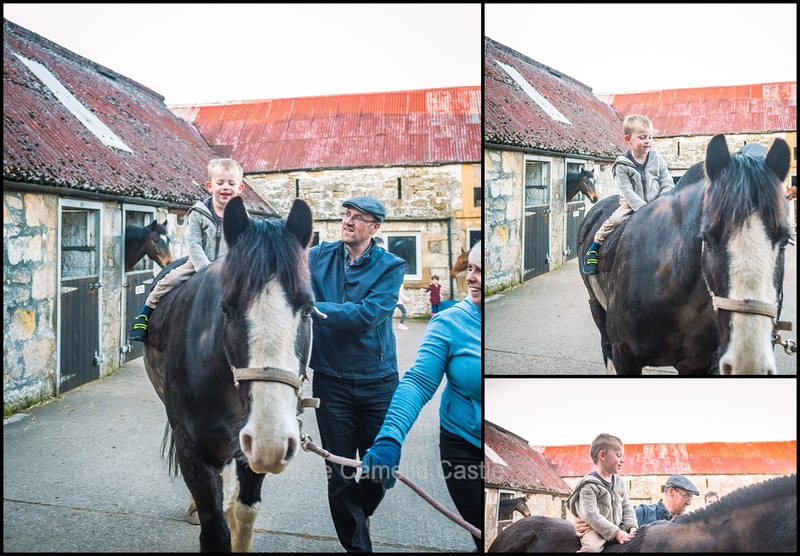 They were both keen on having their first ever horse ride and Laddie was very patient with them. 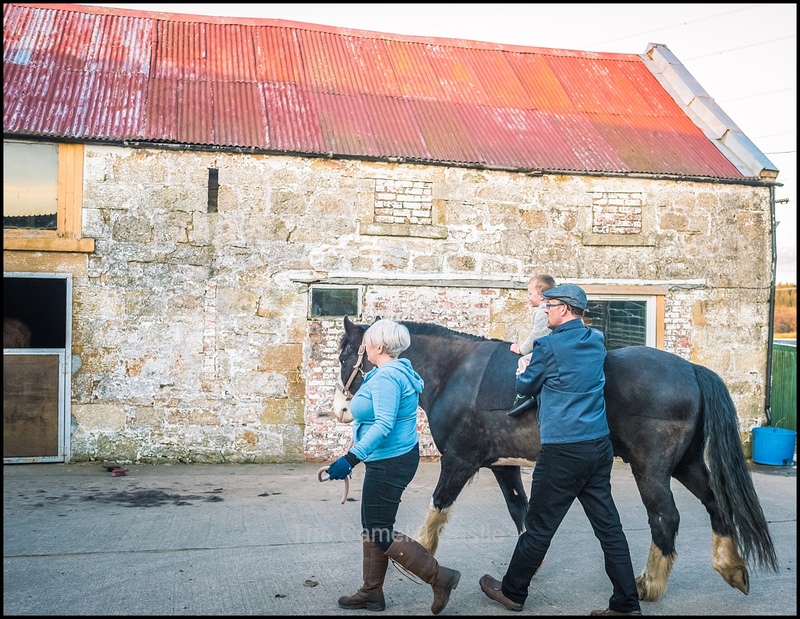 Astrid couldn’t stop grinning her head off as she was led around the yard on Laddies back……..
After a few more pats for Laddie he was most disappointed to be returned to his stable. The kids then said hello to a few of the other farm horses while playing with Bri on hay bales. All the kids now best of friends. It was now almost 8.30pm and getting rather dark so we had to reluctantly bundle our kids into the car and drag them away from their new friends for the drive back into the city. The kids were not happy, and there were a few tears but it had been a long day. 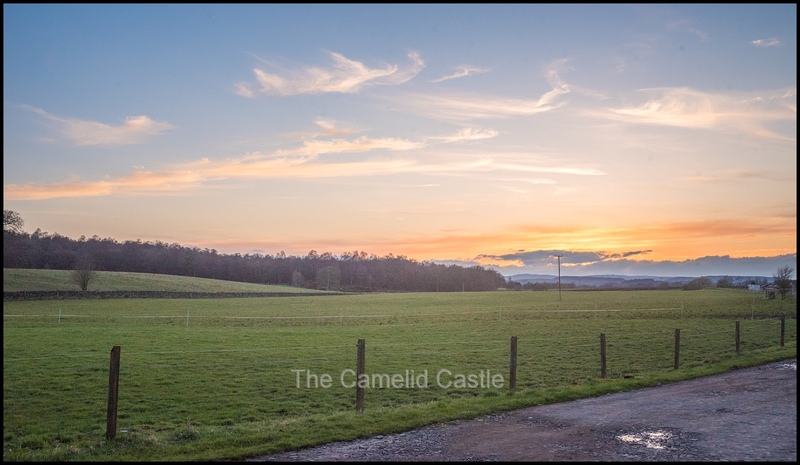 The drive back to Glasgow was around 40 minutes and we did get a pretty sunset and a take away coffee at a service station when one of the kids inevitably needed to go to the toilet! Once we made it back to the city it was impossible to get a park near the apartment, meaning it was well after 9.30pm when the kids were finally in bed. It didn’t take them long to drift off to sleep and the adults had the less exciting job of packing up for our departure to the Highlands the following afternoon. 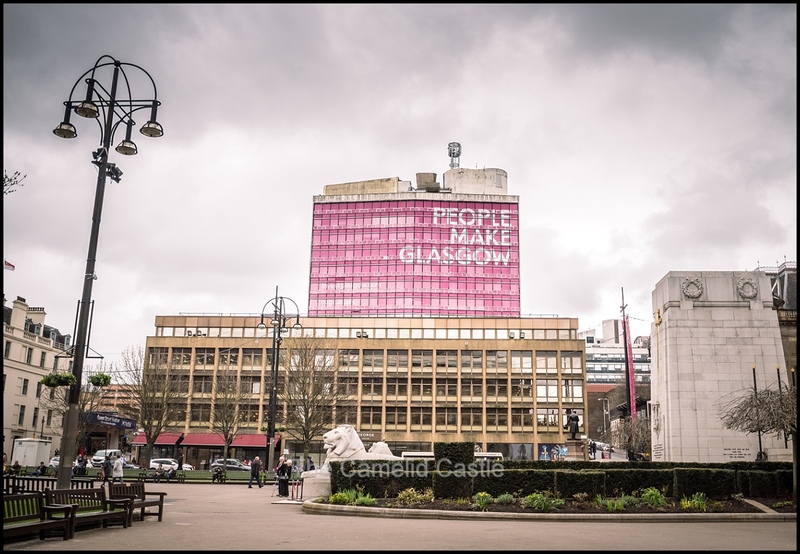 Daily statistics for Wednesday the 18th and Thursday the 19th of April in Glasgow, Scotland – the temperature range for the 18th was a very pleasant 11 to 17 degrees with an average of 14 degrees, and sunshine. The 19th was similar with a slightly colder start of 10 degrees. 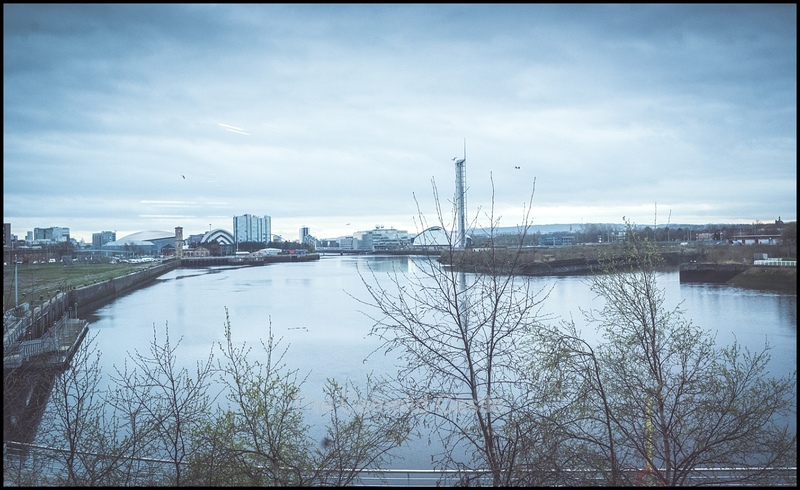 We’d lucked out with the Glasgow weather this week! The total walking for the 18th was 12.7km, our trek to the museum was partly to blame! The total walking on the 19th was a slightly shorter 10.2km, still not too shabby given we caught the train. Up next, our final morning in Glasgow was spent at Pollok Country Park with our first hairy coo pats! 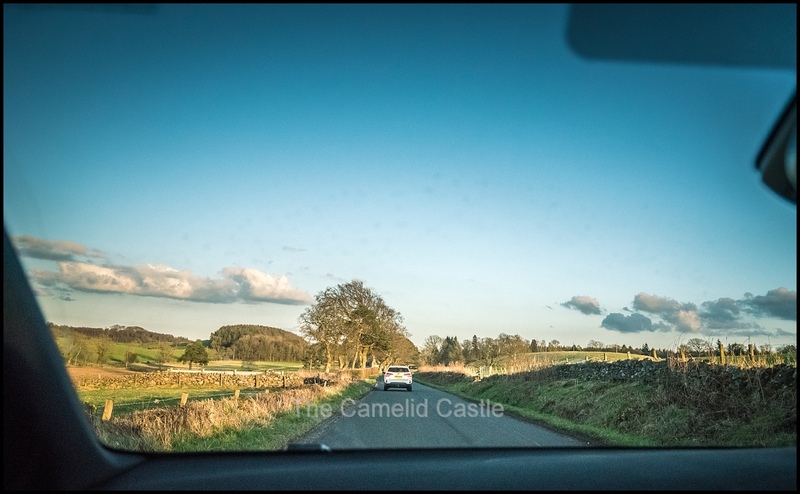 We explored the park, lunched at Pollok house in the sunshine and then headed North to Pitlochry for a visit to the Highland Chocolatier and Dewars distillery, the start of our several days in the Scottish Highlands. 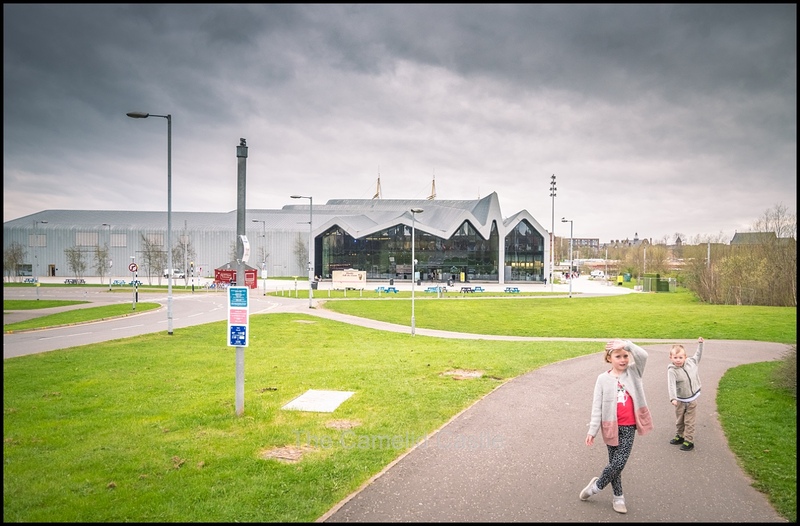 Posted in 4 years, 6 years, Astrid, Glasgow, horse, Kelvingrove Museum, kids, museum, Park, Riverside Transport Museum, Scotland, Soren, Stirling, Travel, travelling with kids, UKBookmark the permalink.